Thank you for visiting our site! Please let us know if you have any questions. 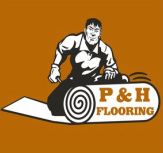 More than just a flooring store P&H not only offers a wide variety of flooring options for your home or business, we offer high quality, free estimates, reliable installation, and excellent customer service. We have carpet, tile, vinyl, hardwood, laminate, and more flooring available in all colors and styles. Let our professional and experienced sales associates help you decide what will work best in your space. When it comes to care and maintenance of your floors we have you covered too! Not only do we offer professional carpet and upholstery cleaning, we have the knowledge and products required to keep your tile and hardwood looking new. If you're thinking about building that dream addition, renovating your master bedroom or bath or updating your kitchen, we can help. P& H can provide and install custom tile showers, back splashes, tile or hardwood floors. With one simple call, all your flooring and tile projects could be finished. Call today or visit our Estimates page for a free estimate. Not ready to replace a floor? We can refinish your old hardwood floors to make them look new again and our professional cleaners can revitalize your carpets. Please be sure to visit our Products page for a sampling of our flooring options and our Services page to see everything we have to offer you. If you have any questions, concerns, or would like to get more information please contact us.